Made In Canada/Cambodia. Easy Care Machine Wash, Hang to Dry. 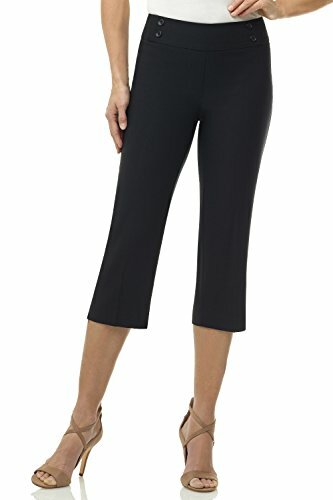 ALL-DAY COMFORT: Pull-On Styling (No zipper) With elasticized contoured waistband for extra comfort. Back Darts for a smoother fit - no gaping! CHIC AND VERSATILE: Matching button detail on the front waist. Pressed front and back crease for a classic look. Wear it dressed up, at work or the office, or dressed down for casual day wear. DETAILS: Regular Inseam 21" / Petite Inseam 19.5". Leg Opening 17". Model is 5'9" and wearing size 6.